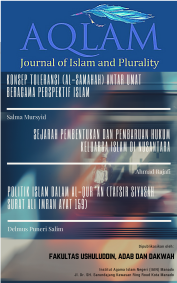 AQLAM: Journal of Islam and Plurality (P-ISSN 2528-0333; E-ISSN: 2528-0341) is a journal published by the Ushuluddin, Adab and Dakwah Faculty, State Islamic Institute of Manado, Indonesia. AQLAM published twice a year and focused on the Islamic studies especially the basic sciences of Islam, including the study of the Qur’an, Hadith, Islamic Philosophy, Islamic History and Culture, Theology, Mysticism, and Local Wisdom in Indonesia. It is intended to communicate original research and current issues on the subject. This journal warmly welcomes contributions from scholars of related disciplines. Every article submitted and will be published by AQLAM will review by two peer review through a double-blind review process | Address: Jl. Dr. S.H. Sarundajang Kompleks Ring Road I, Kota Manado, Sulawesi Utara, 95128 | E-Mail; aqlam@iain-manado.ac.id | Phone: +62431860616 | AQLAM has become a CrossRef Member since the year 2018. Therefore, all articles published by AQLAM will have unique DOI number.